^ Volvert ML, Seyen S, Piette M, et al. (2008-06-12). “Benfotiamine, a synthetic S-acyl thiamine derivative, has different mechanisms of action and a different pharmacological profile than lipid-soluble thiamine disulfide derivatives.”. BMC Pharmacol. 8: 10. doi:10.1186/1471-2210-8-10. PMID 18549472. http://www.biomedcentral.com/1471-2210/8/10/abstract. ^ J Lin, A Alt, J Liersch, RG Bretzel, M Brownlee (May 2000). “Benfotiamine Inhibits Intracellular Formation of Advanced Glycation End Products in vivo”. Diabetes 49 (Suppl1) (A143): 583. https://www.benfotiamine.net/images/Benfo600Study.pdf. ^ a b Balakumar P, Rohilla A, Krishan P, Solairaj P, Thangathirupathi A (2010). 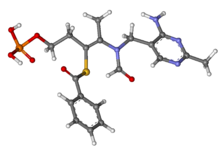 “The multifaceted therapeutic potential of benfotiamine”. Pharmacol Res 61 (6): 482–8. doi:10.1016/j.phrs.2010.02.008. PMID 20188835. ^ Hammes, HP; Du, X; Edelstein, D; Taguchi, T; Matsumura, T; Ju, Q; Lin, J; Bierhaus, A et al. (2003). “Benfotiamine blocks three major pathways of hyperglycemic damage and prevents experimental diabetic retinopathy”. Nat Med 9 (3): 294–299. doi:10.1038/nm834. ^ Stirban A, Negrean M, Stratmann B (2007). “Adiponectin decreases postprandially following a heat-processed meal in individuals with type 2 diabetes: an effect prevented by benfotiamine and cooking method”. Diabetes Care 30 (10): 2514–6. doi:10.2337/dc07-0302. PMID 17630265. ^ Stracke H, Hammes HP, Werkmann D (2001). “Efficacy of benfotiamine versus thiamine on function and glycation products of peripheral nerves in diabetic rats”. Exp. Clin. Endocrinol. Diabetes 109 (6): 330–6. doi:10.1055/s-2001-17399. PMID 11571671. ^ Stirban A, Negrean M, Stratmann B (2006). “Benfotiamine prevents macro- and microvascular endothelial dysfunction and oxidative stress following a meal rich in advanced glycation end products in individuals with type 2 diabetes”. Diabetes Care 29 (9): 2064–71. doi:10.2337/dc06-0531. PMID 16936154. ^ Babaei-Jadidi R, Karachalias N, Ahmed N, Battah S, Thornalley PJ (2003). “Prevention of incipient diabetic nephropathy by high-dose thiamine and benfotiamine”. Diabetes 52 (8): 2110–20. doi:10.2337/diabetes.52.8.2110. PMID 12882930. ^ Yamazaki, M (1968). “Studies on the absorption of S-benzoylthiamine O-monophosphate : (I) Metabolism in tissue homogenates”. Vitamins 38 (1): 12–20. ^ Volvert, M.L. ; Seyen, S.; Piette, M.; Evrard, B.; Gangolf, M.; Plumier, J.C.; Bettendorff, L. (2008). “Benfotiamine, a synthetic S-acyl thiamine derivative, has different mechanisms of action and a different pharmacological profile than lipid-soluble thiamine disulfide derivatives”. BMC Pharmacology 8 (1): 10. doi:10.1186/1471-2210-8-10.